This is Book One of the Song of the Lioness quartet. Alanna and her twin brother, Thom, are about to pull a switch so she can fulfill her dream of becoming a knight, and he can go to learn sorcery. 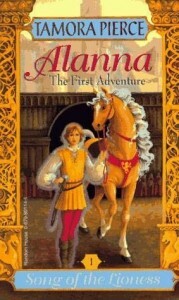 So, Alanna disguises herself as a boy, becomes Alan of Trebond, and begins the journey to knighthood. She needs to find the strength to defend herself, both physically and mentally, against bullies. In the process, she makes friends with the future king and with a thief. Then, the prince's uncle, Duke Roger enters the world, and Alanna's magic is tested. This book is the best book I've ever. I love everything about the book, from the intricately crafted world to the stubborn heroine.